The Kunstflugteam Franken is an institution since 1986, in Franconia and far beyond. But Kalle and Peter are also flight instructors for many years - and for years they have been offering training sessions for the aerobatics license. Uli took his first aerobatic baby steps with the two at their home base of Hetzleser Berg (sorry, the hammerheads are still a problem once in a while ...). Great opportunity for training. 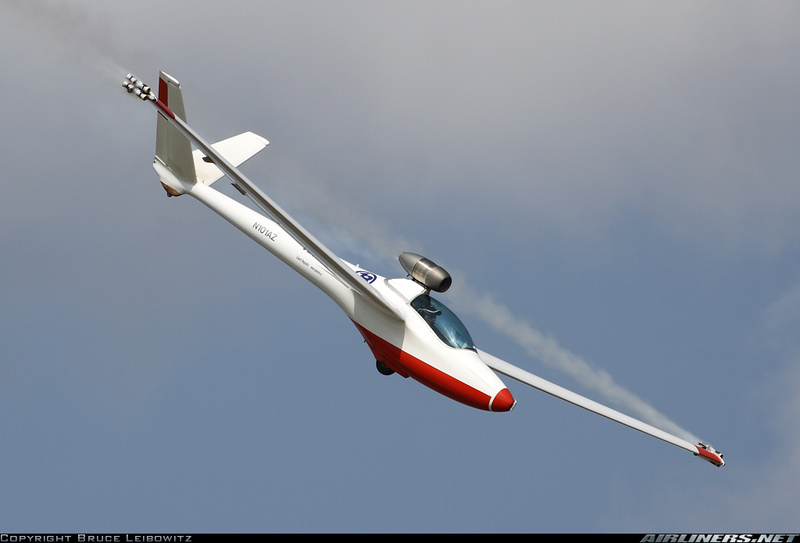 Once a year the training week of Glider Aerobatics Rheinland-Pfalz e.V. is providing the platform - since 2005 at the airport Bitburg. There is much more than meeting interesting people: Regardless of Fox or LO 100 - the box is crowed by all aircraft, that fly inverted. Manfred Radius lives in Canada. His performances at air shows all over North America are legendary, just as well as his aircraft, a H 101 Salto with the registration C-GJND. He too is a flight instructor and a cautious pilot, inspite of his spectacular performances. Skydance is a mixed team between glider and powered aerobatics. Their best known team member is Wilhelm Dueerkop. Another Skydance-Team: Skydance Competition does flight shows, but is also attending serious competitions. Just as well... Bob Carlton has equipped his Salto with a little jet engine , he is touring flight shows in the US. Accordingly, his homepage his been renamed from SilentWings to VertigoAirshows. Segelkunstflug represents the official competition scene in Germany. Luckily, there are still quite a few of great competitive events that are based on local initiatives.